Hi, friends! Happy Monday! I hope you all had a fabulous weekend! The Pilot had his first weekend off in over a month so we took a little trip down south to Charlotte, North Carolina for the weekend! 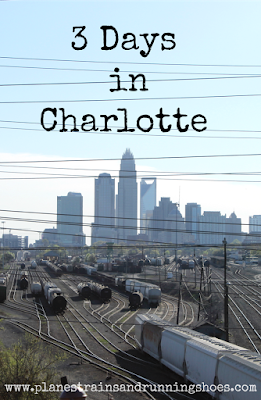 The Pilot flies to Charlotte all the time and really loves it. When he found out he was going to have this weekend off, we decided to head to Charlotte because 1) I had never been there before, and 2) It's close to DC and we could make a short trip out of it. We boarded an early flight Thursday morning and headed down to Charlotte. We booked an Airbnb for the first time! 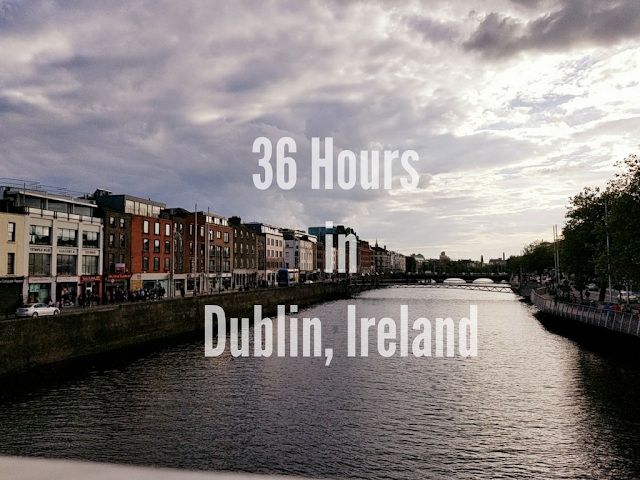 I've been wanting to book with Airbnb but we've never been able to find the right amalgamation of price, location, and available dates to make it work for any of our trips, so I was really excited! Our Airbnb was located right on a Light Rail stop between Uptown and the South End, which made it perfect for exploring both areas of the city! 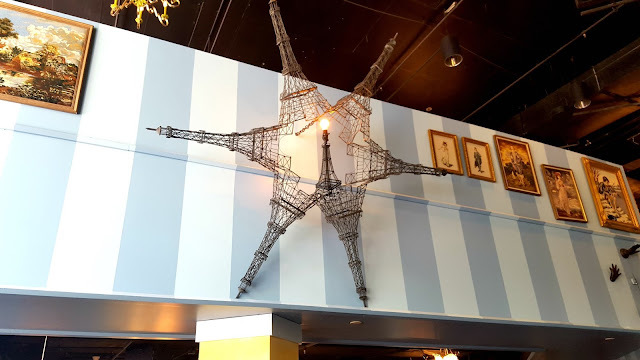 We checked in without any issue and then made our way straight to Amelie's French Bakery and Cafe. I had to work on Thursday, so I settled into Amelie's, ordered some coffee, a croissant sandwich, and some macarons and settled in to work. The Pilot hung around with me for a little while and then went off to explore the city. It might sound crazy but I really loved working from Amelie's. My new job allows me a lot of flexibility, which I really needed, so it was nice to pop down to a different city and get some work done while people watching from a place that I read about in just about every material I read about Charlotte before heading down! After a few hours, we made our way to the Epicentre for lunch and wandered around the area for a bit before heading back to the apartment. We had been up since 5 and The Pilot was exhausted, so he took a nap and I finished up work. It was St. Patrick's Day, so we made our way back to the Epicentre for a round of drinks, spent some time walking around Uptown, and then hopped on the Light Rail and rode it a few stops to the South End for dinner. 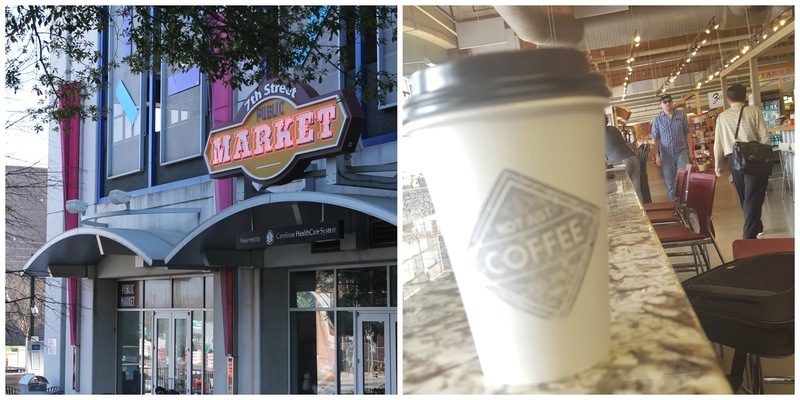 Friday morning, we headed back to Uptown to the 7th Street Public Market. I grabbed a delicious cup of coffee from Not Just Coffee and breakfast from Hazelnuts Creperie and sat down to work while The Pilot mapped out our day. 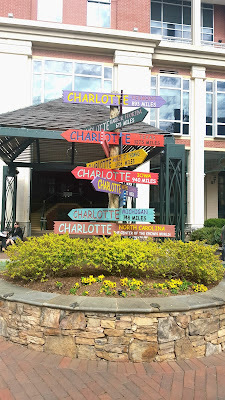 Once I finished working, we went for a walk around the 4th Ward...Charlotte's gorgeous historic district which I later found out was revitalized by the Junior League of Charlotte! We picked up a couple B-cycle bikes (Charlotte's bike share) and went back to our apartment to drop off my computer and then grabbed lunch in the Epicentre before heading back to 7th Street Public Market to pick up a few beers and take a ride on the Funny Bus! The Pilot found out about this tour company that does comedy tours of the city. He typically isn't one for guided tours so if he was interested, I was game. We had so much fun! First of all, you can bring beer and wine and they turn the tour into a drinking game. The tour was hysterical and such an awesome way to see the city! The company only just started up in November but we had a full bus, so they must be doing pretty well! On the Funny Bus, our tour guide pointed out King's Kitchen and Bakery, a nonprofit (!) restaurant in Uptown. Drawn to the mission, The Pilot and I headed there for some Southern Comfort Food for dinner. After dinner, we made our way back to the South End to check out the Sycamore Brewing Company. That was the place to be on Friday night in Charlotte! It was packed! It seemed like everyone at the brewery had a dog with them which I loved! The Pilot and I grabbed a few beers and sat down, enjoying the crowd and the live music. We spent a few hours there before calling it a night. We weren't sure when we were going to head out on Saturday since it was supposed to be cold and rainy all day, but when we woke up, the sun was shining and it was beautiful out! 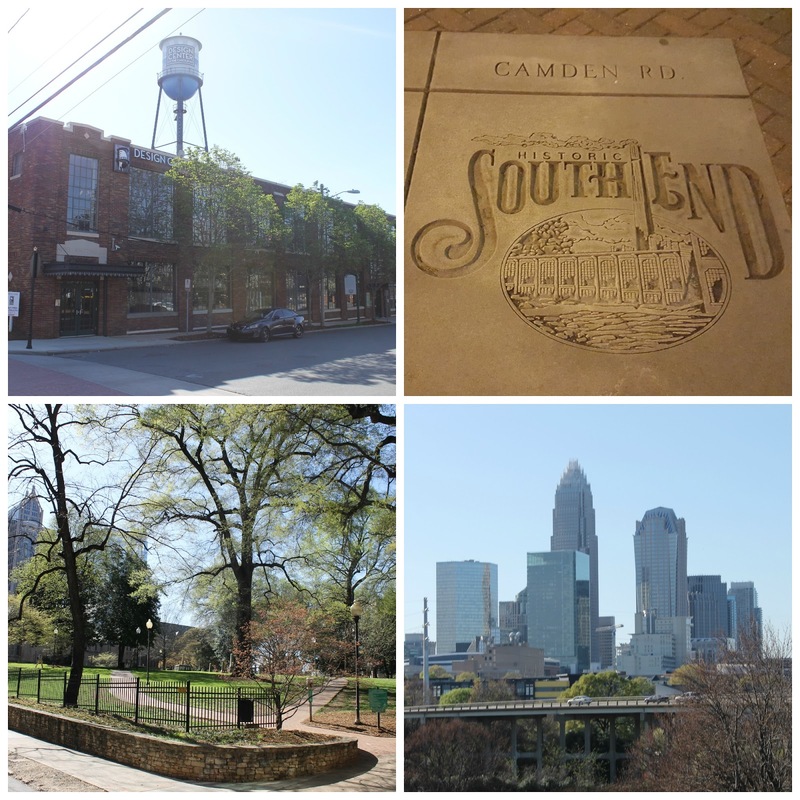 I really wanted to go for a run in Charlotte, so we hopped on the Light Rail to the South End and then ran to Freedom Park. It was beautiful! Oh my goodness, it was absolutely picture perfect! From the South End to the park was about 1.5 miles, so we ran there and then ran another 2.5 miles in the park. 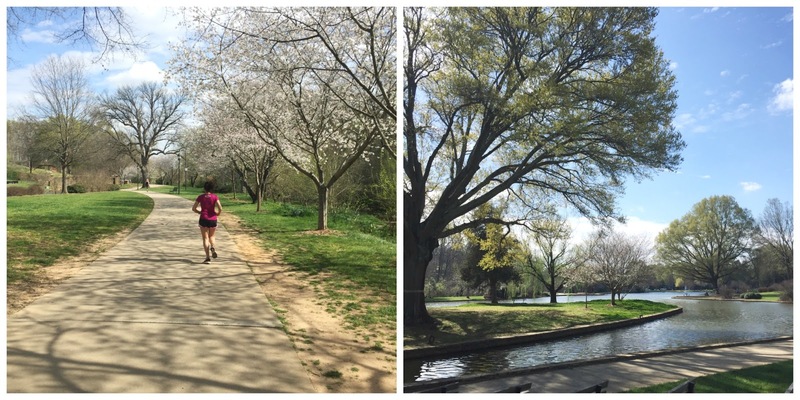 It was an absolutely gorgeous day and I just loved running through the park. We finished up our run and then hopped on some B-cycle bikes and made our way back toward the South End. We stopped for brunch at Sunflour Baking Company and then made our way back to our Airbnb and got ready to make our way back to the airport! It was a perfect weekend in Charlotte! I loved exploring the city and really loved the South End! It seemed like Uptown was where everyone seemed to hang out, but I really liked the vibe of the South End. I'm glad our Airbnb was in between both! I really liked Charlotte! I loved riding bikes around, sampling their multitude of craft beers, and exploring the city. We made it back to DC and picked up Peyton from her first Dog Vacay (more on that later!) and spent Sunday with friends having brunch, playing games, and making the most of the cold front that came back to DC.